We’ve mentioned it before but there are over 200m Tweets each and every day. 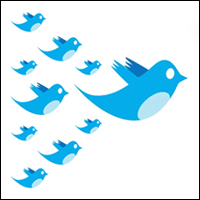 So, in all that noise how do you get your Tweets noticed, retweeted and in turn get more Twitter followers? Though numbers aren’t everything, they do help and if you can increase follower count through engaging new accounts initially. While then continuing to engage when they follow, you are on to something very positive. Garnering increased numbers via engaging optimised Tweets is a sure fire way to success and making the most of the micro blogging platform. Social media marketing is not merely about fighting with competitors for a slice of the pie anymore. It’s about grappling with everyone. The average feed has posts about everything from abattoirs, to football, to stilettos positioned beside each other. Remarkable content is king, but even amazing content can struggle for attention. So, here’s how to get more attention for your Tweets and get more Twitter followers according to Buddy Media’s results. Studies have shown that the best days for engagement are Saturday and Sunday, with Wednesday and Thursday the worst days. This is very similar to what we found in our timing Facebook posts article a few weeks ago and once again businesses only schedule a small number of Tweets on these days – in fact only 19% over both weekend days combined. Tweets published during working hours are around 30 per cent more likely to gain attention and engagement than those that are tweeted outside of the time frame. This even follows through for the weekend. We’ve previously talked about the length of Facebook posts and how best to optimise and it seems with Twitter succinct is better. Tweets that are below the 17 per cent mark offer a 17% higher opportunity for engagement. According to reports, Tweets that include hash tags are twice as likely to experience engagement and garner some interest and increase Twitter followers. However, though it may come as a surprise under a quarter of brands use hashtags in Tweets. However, hashtag overkill is also evident and it seems that more than two hashtags results in a 17% drop in engagement. It seems that you don’t get anywhere without asking in life and social media. Tweets with a ‘Retweet’ or ‘RT’ at the end have a 12x time higher chance of being retweeted. However, only 1% of brands ask for a retweet even though the action is proven to work and is an easy and effective way to amplify your message. Even more interesting is the fact that asking for a ‘RT’ increases the likelihood by 10 times; however asking for a ‘retweet’ sees a 23x rise in retweets – simply amazing. Engaging and getting more twitter followers is easily done and can really make for a successful sustainable utilisation of Twitter for your brand. Looking for a Social Media Agency for your Twitter campaign? Hire us for social media marketing.